My little office/guest room/tiny house that’s connected to the back of our barn has been through a lot these past three years. But even with the huge transformation from dude sawmill office to girlie office, I still found myself hesitating to go out there and work. I shared what held me back from working out there in this post, to summarize: it’s colder and darker out there than I’m comfortable with. I decided to pay attention to my own preferences (to be warm and to actually see) and it was amazing how easily the solutions came. And y’all, I hate disclaimers but this room is almost impossible to photograph. It’s either dark, or it’s the 20 minutes of the day where the sun shines through the door, my apologies. 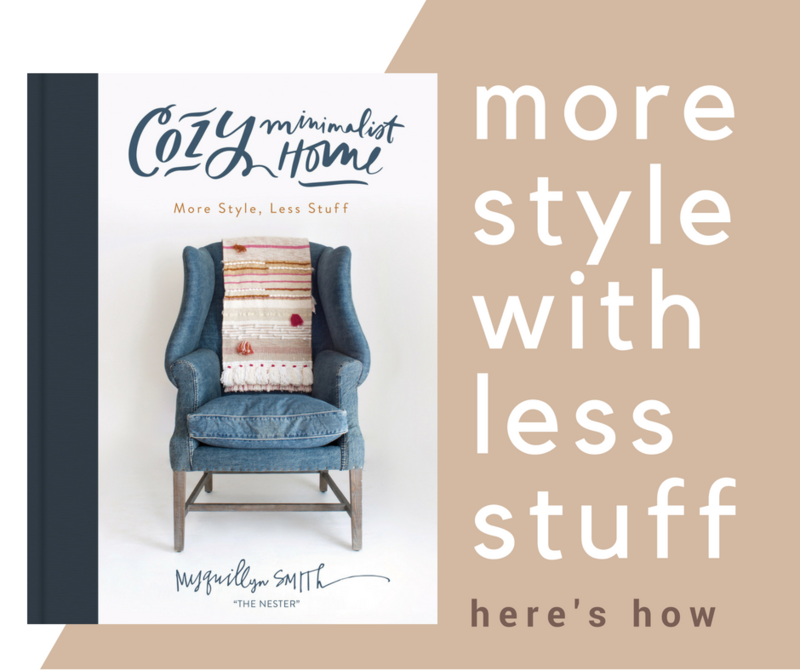 When I first started using the office I layered cowhides all over the floor–it’s what I had and that’s a smart way to start. I actually love this look for this particular space, but, they do nothing to keep the chill off of your feet especially when layered on top of concrete floors. It was time to get a grown-up-lady rug. It can be TERRIFYING to buy stuff online for your home. And even MORE TERRIFYING to buy something that is a pain to return. Ask me how I know. But, I’ve found that sometimes the best selections and prices (bonus, introvert heaven) are online. 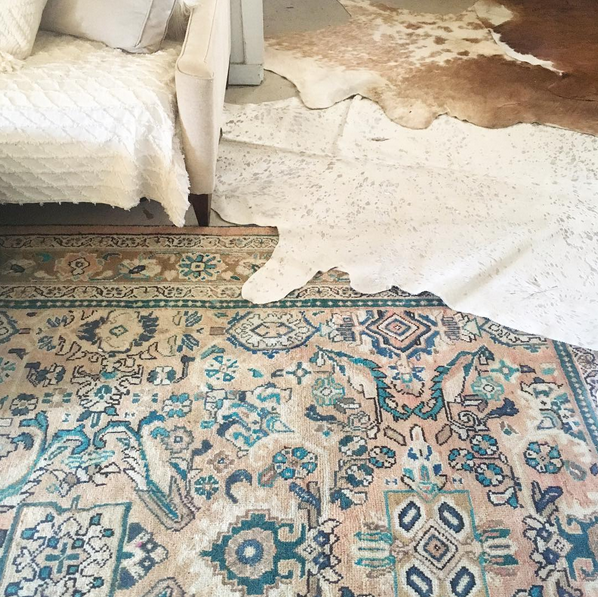 I purchased every rug in my home and barn online–without seeing them in person first. 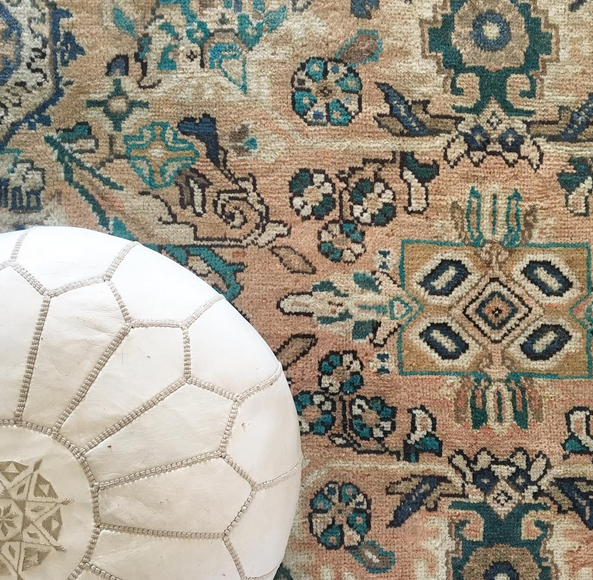 I’m happy to report that this rug and its colors were represented practically perfectly in the online photos. That’s another scary part of online shopping. If you compare my photos of the rug with the big photo above from the website, it looks like a different rug. That’s because the natural lighting is so awful in my office that I have to doctor up the photos so you can see them and it changes the color a little. 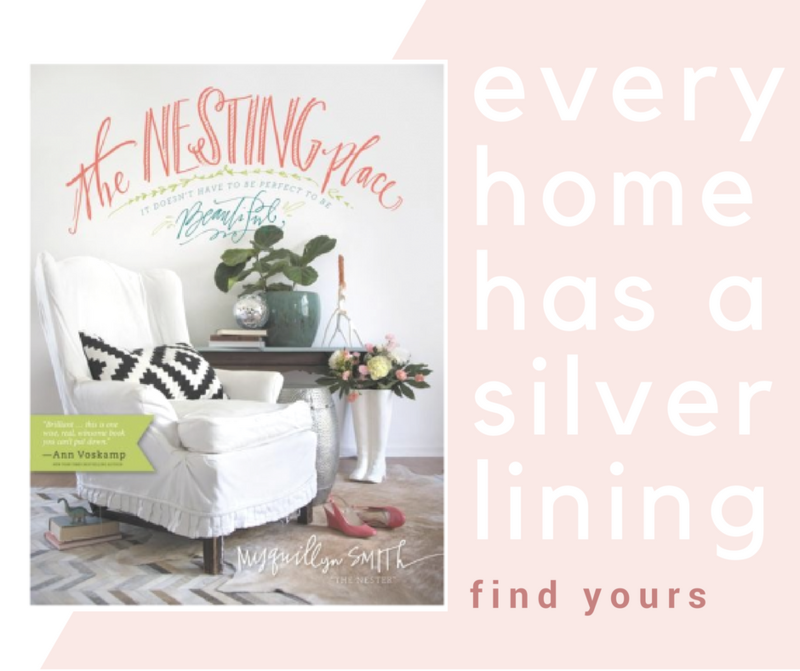 In real life, the rug colors are almost identical to the photo above an that’s what you need to know when you are shopping online so you aren’t surprised. My rug is from eSaleRugs.com (free shipping + free returns!) and I’m thrilled with it. 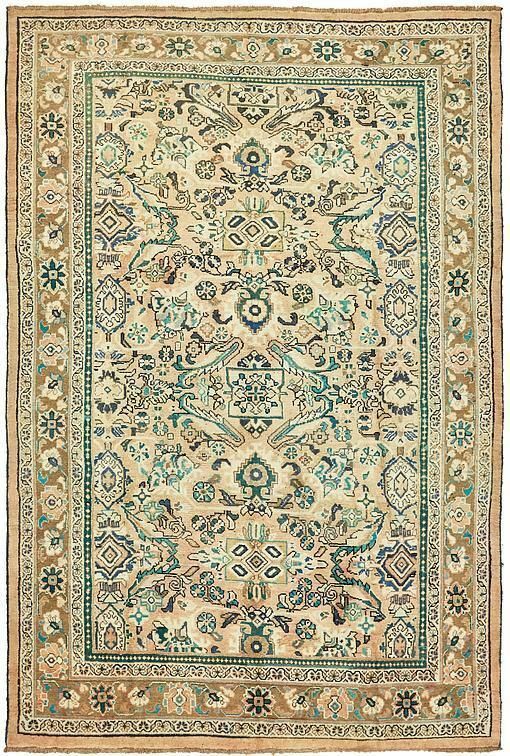 This is a one of a kind, Persian rug that’s older than I am and the quality is amazing. It’s my first grown-up rug and it’s wool, so it instantly warmed up the room visually and physically. 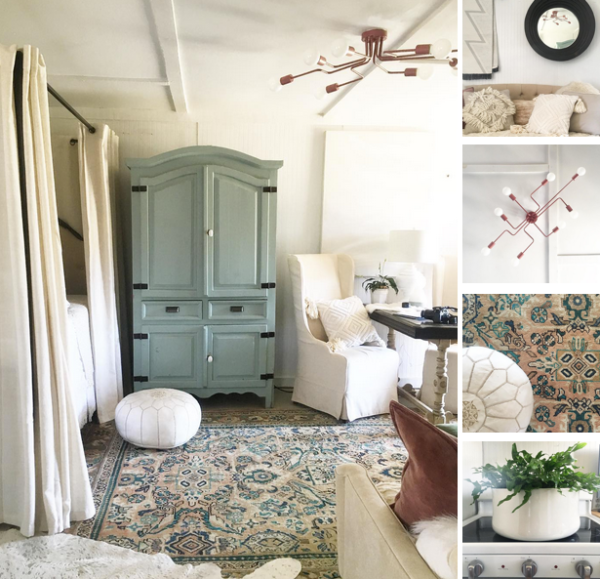 I felt confident the rug colors would be right because I read other reviews and there were six different photos taken at different angles and distances so I could make a good decision. 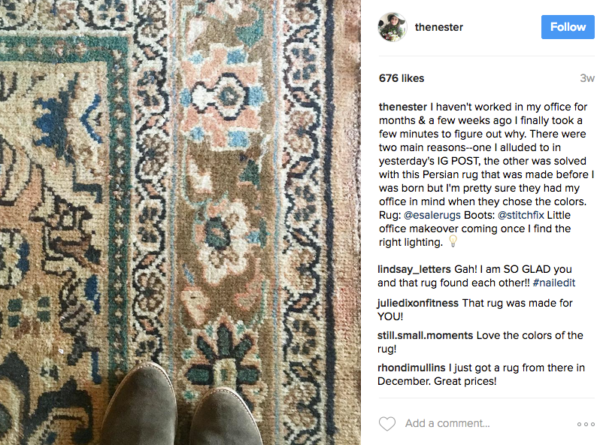 excuse how the rug has a blue undertone in his photo–see what I mean?! We haven’t really had a cold day for weeks (it was 80 degrees yesterday) so I haven’t totally solved the heat problem, but over Christmas Chad and I stayed at a friend’s house and she had one of these in the guest bedroom. Kind of like what a hotel has–even with a remote! It was so great. I also like the idea of these–because venting is even less intrusive–anyone have experience with this kind of heater/ac? 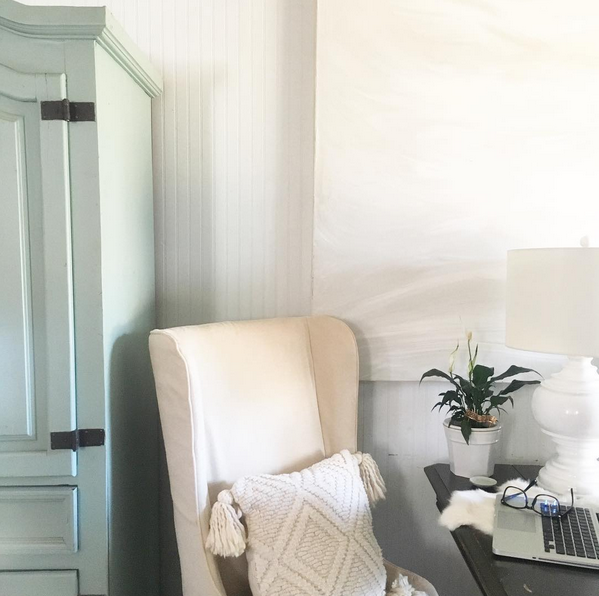 Once I knew I needed lighting I immediately went to my favorite place to find lamps TJMaxx/Marshalls/HomeGoods (the holy trinity of home decor) and I found the perfect “lady lamp” for this space. I loved the shape and interest it could add to the room. But the black felt all wrong for my lady office. It took me about two weeks to work up the courage, but I finally purchased it knowing I was going to immediately spray paint it pink. Here it is right after Chad put it up–you can still see the unpainted ceiling where the old light was. BUT, once it was hanging I felt the pink was too light. I asked Megan to mix up some random paints and paint it a darker shade and touch up the ceiling with whatever white paint she could find until I can locate the ceiling paint (that will probably never happen). So now my office is warmer and cozier and I’ve been working here in the office almost daily! Mission accomplished! 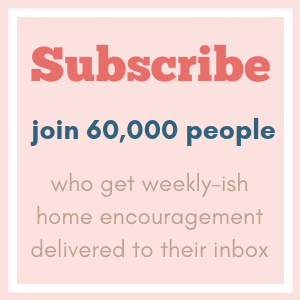 This post contains affiliate links, special thanks to eSaleRugs for partnering with me! We had those wall units in Mumbai, where we lived for a year – they’re standard there, although no heat, because Mumbai. There was one in each room, and I liked that I could condition part of the flat and not the whole place. I liked too that they cooled the room from above; I’m used to floor registers, and having the cool air drop down makes more sense to me than the vents having to push the air up from the floor. We had ceiling fans, too, to distribute the air. It was a great combo. I have a mini split heat and air unit in my bunkroom…this was a room added on to the house above the garage by the previous owners. They hadn’t wanted to tie it in to the HVAC system of the rest of the house so put in a wall air conditioner (in the closet – so I had to leave the door open to use it) and a small propane stove for heat. 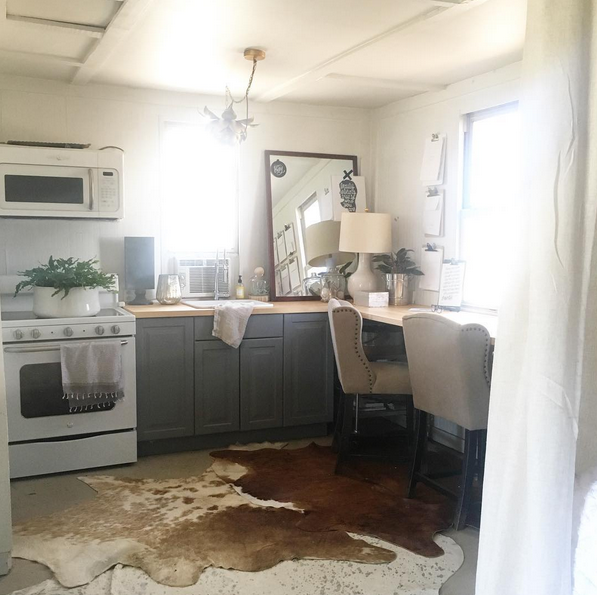 When I remodeled recently, I used the closet(s) for bunks so the air unit had to go and I had never liked how intrusive into the room the stove had been so that went too in favor of the mini-split. Long story shorter – I love it. 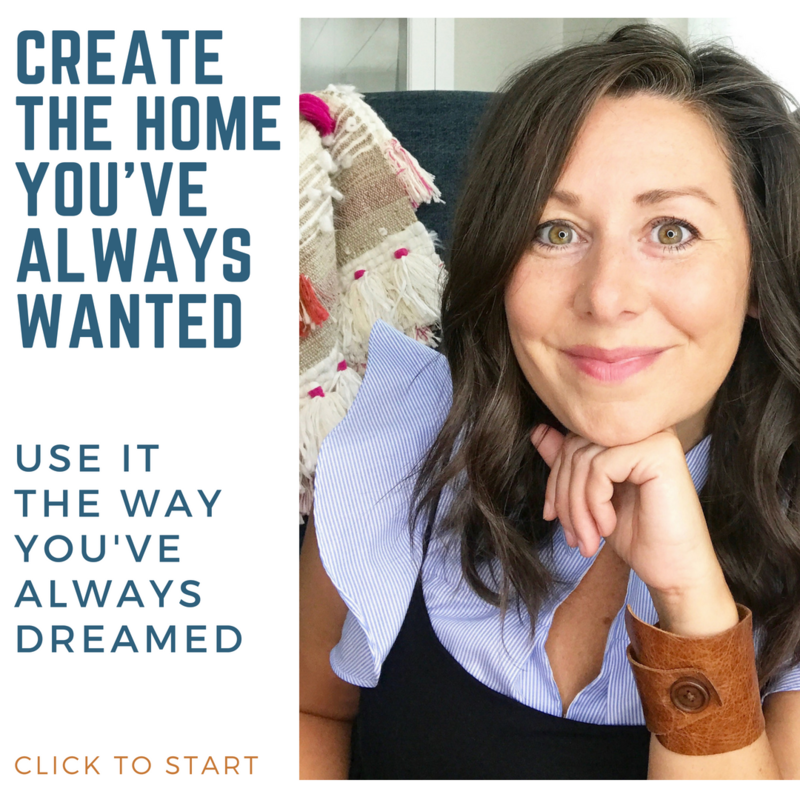 It’s the perfect solution for my space and I’m thinking for yours too – I wouldn’t use it in a space that I heat and cool 24-7 but for one that’s used less often, it’s great. It’s all electric so more expensive to use all the time but works very quickly to heat or cool my space so I only turn it on when I need it and the cost is not an issue. Over all it has been a good answer to heating and cooling our space. We are on our second one in ten years. The first one lasted 8 years and we have had the present one 2 years. I baby it more than the first one hoping to extend its life. 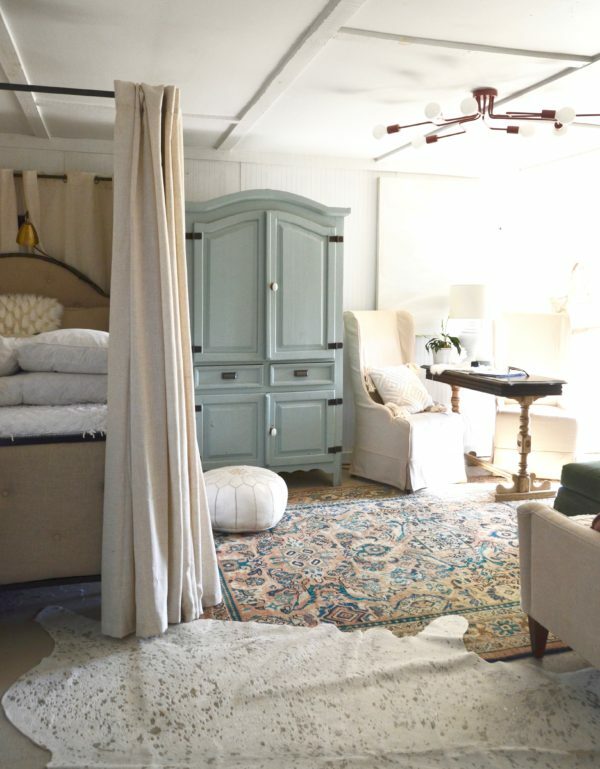 Love the make over and the encouragement to buy a grown up rug. A little portable space heater. We recently stayed with my husband’s boss at his hunting cabin. It was a cold cold weekend, in the 20’s at night. His little house with all hard flooring and no rugs stayed toasty with just one of these heaters in every room. He said they worked so well that he never has bothered to turn on the whole-house electric heat. He uses the little space heaters and it never gets cold. I have to admit, they worked surprisingly well, and it was nice to point them at my feet while sitting and get my usually chilly feet warmed up. For the price point and Lowe’s excellent return policy, it may be worth trying out for your office. 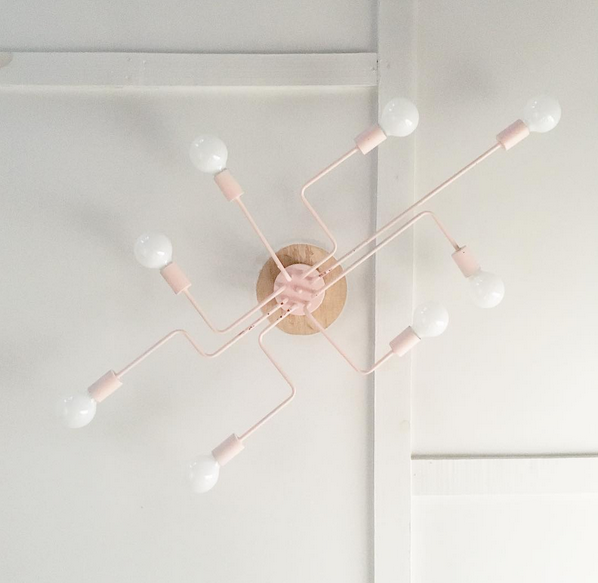 The ceiling light is a perfect solution. The color feels unexpected. thought you would have chosen a gold tone, but i like it. Also, where did you get the office chairs from? 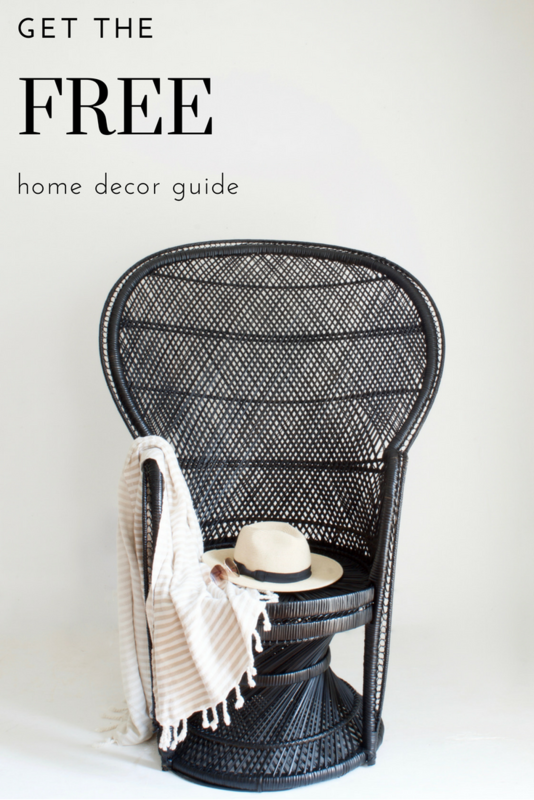 I have been looking for something just like those to go with my windsor kitchen chairs. I still picture that room exactly how it was the first time I entered and swooned. Of course I totally took pictures. If that were my “office” it would look exactly the same these few years later. How I love that you change things up. You have totally maximized that L-shaped space so well! Myquillan, my lurker self had to hope straight over here from my phone when I saw your room and the heater/AC you’re thinking of. We had a different brand, but otherwise the Senville you linked to is exactly what we had to heat/cool our house in Japan, and I LOVED it. Our townhouse had insulation – not necessarily standard in central Japan – and no central anything, which is also normal. It worked so well, and I loved being able to heat just the areas I wanted to keep warm without wasting heat/air-con on, say, the guest/junk room. Somebody else mentioned the “dry” function, too – that was also awesome. Just pulling the humidity out of the air during the summer made a huge difference. I always guessed that our climate there was similar to Georgia, so I think it would work well for you. Love your vision! 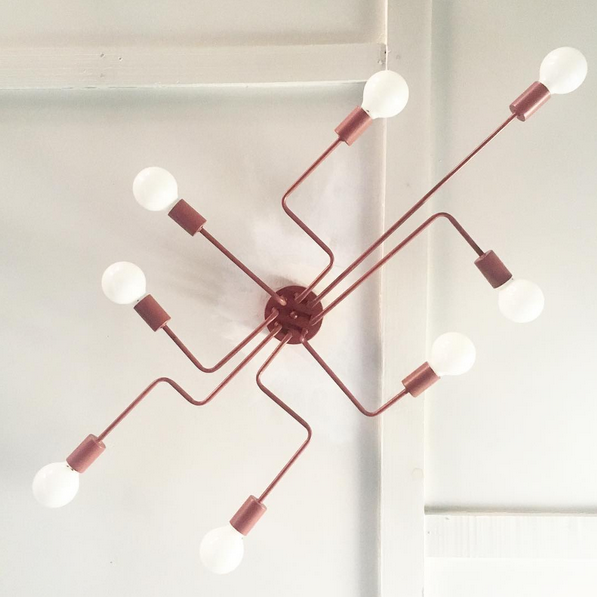 I would have immediately dismissed the light fixture as too industrial for me, but with the paint and light bulbs, I love it. ‘Just what I need above my kitchen island. 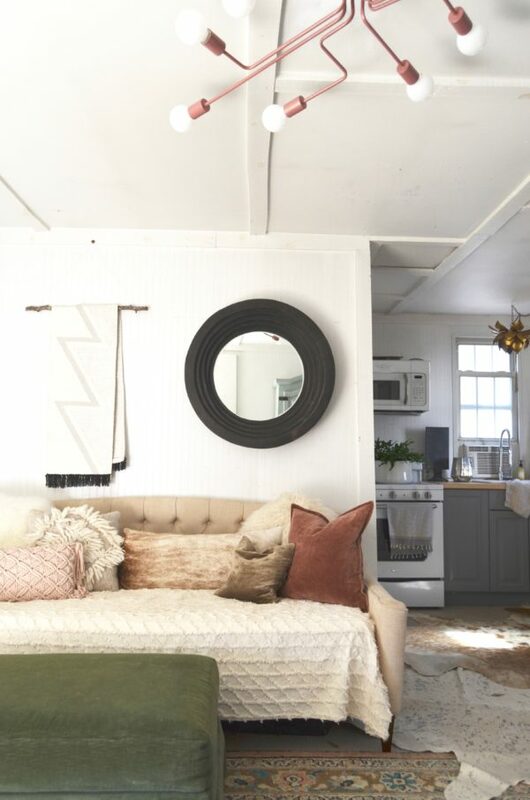 The light fixture and one pillow are almost copper-colored, and they add a lot to the visual warmth. I would be looking for ways to add some real copper to the room, it is hard for me to feel cold when I am looking at copper. Love the space! I have LOVED those GE Artistry appliances from the minute I first saw them! (I know I pinned the heck out of your posts when you bought them!). But the sad news is that GE is no longer making them. waaah! I always pictured myself buying those when I finally got in to my dream vintage home. Guess I will have to spring for the REAL vintage appliances one day….like the ones in Lorelai’s kitchen on the Gilmore Girls. :) Blessings! i am really sensible on the decoration of my house and office. actually because my living place and my office are in one place, so trying to improve decoration has two benefit for me. Love love this space. The rug link only takes to sight not the actual rug, would you mind sharing? Home run on the rug!! Love the colors and a Persian will live longer again than you!!! Great choice! Stunning and awesome office, thanks for sharing photos. The rug is excellent. LOVE IT! Thanks for the online rug source (coming from a fellow introvert)! I just finished painting my stairs and need a runner. Heading over to the site immediately!